Loyal customers are the beating heart of every great business. So why do so many companies act like adrenalin junkies, chasing after new customers at the expense of creating deeper, more profitable relationships with the ones they already have? 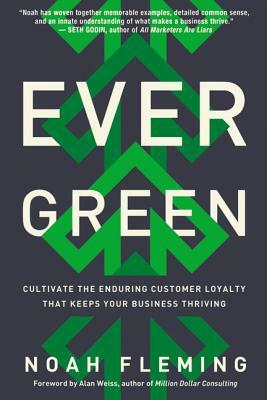 Evergreen exposes the mad pursuit for what it is: a brief spike in metrics and an ongoing revenue drain, as one-time customers fail to return. A better solution is to shift resources from attracting new customers to engaging the base-the path to stable growth, season after season. The book's entertaining stories and action steps reveal how anyone can: Cultivate the 3Cs of evergreen companies: character, community, and content * Build loyalty programs that turn satisfied customers into enthusiastic advocates * Nurture profitable customers while pruning those who sap time and money * Inject authenticity into social media communications * Invert the expectations gap that can drive customers away From Internet startups and mom-and-pop businesses to multinational giants, strong companies are rooted in customer retention. Evergreen helps anyone merge high-tech tools with the personal touch to forge lasting bonds and steady profits. NOAH FLEMING is a strategic marketing expert and CEO of Fleming Consulting & Co. He has provided coaching and consulting services for thousands of business owners, executives, and individuals, and is an expert blogger for FastCompany and guest blogger for The Globe and Mail's "Report on Business."